Investigators from ETH Zurich have quite literally shaped a "cell phone": they have reprogrammed mammalian cells in such a way that they can "phone" each other via chemical signals. Telephoning is a common exchange of information: A phones B and they both agree what B should do. Once this is done, Party B phones Party A to let him or her know. A no longer phones B. During this two-way communication, electrical signals are sent, and for their transmission suitable devices are necessary. Based on this formula, a team of bioengineers headed by Martin Fussenegger and Jörg Stelling at ETH Zurich's Department of Bio systems Science and Engineering in Basel has planned mammalian cells in such a way that two cells can communicate via chemical signals. The scientists have thus incorporated a synthetic two-way communication system into mammalian cells for the first time that also responds to concentration differences in the signal molecules. The researchers used suitable signal molecules and constructed "devices" out of biological components that receive, process and respond accordingly to the signals. The devices consist of suitable genes and their products, proteins, which are linked to each other logically. An enzyme produces the amino acid L-tryptophan from indole, which has been introduced into the sender cell from outside. This little molecule enters the receiver cell, which processes the signal. The response to L-tryptophan is that the receiver produces acetaldehyde, which the sender cell can receive. If, after a certain time, a particular concentration of acetaldehyde has been attained or the indole is depleted, the sender cell stops producing L-tryptophan and the system switches it off again. "This systematic communication network is quite literally a 'cell phone'," says Martin Fussenegger. Although other scientists have already developed synthetic communication networks for bacteria and yeast cells, theirs is the first for mammalian cells as this cell type is far more complex. For their experiment, the Basel-based researchers used so-called HEK cells – human kidney cells, in other words, which are often used in research. Moreover, the biological components necessary to construct the signal network can be used in a modular way. With these modules, the researchers were also able to connect other signal paths, including a signal cascade leading from the sender cell, through the information processing cell to the performing receiver cell without any feedback. Two-way communication between different cell types is important in multicellular organisms. It regulates inflammatory responses, the development of extremities like hands and feet, controls the body's blood sugar level via insulin and glucagon, and controls the development and maintenance of the vascular system. Thanks to their "cell phone", the ETH-Zurich biotechnologists were able to simulate the latter accurately in a cell culture. They placed the sender and receiver module in the culture dish along with a population of endothelial cells, which line the blood-vessel walls. In response to the tryptophan signal, the receiver module formed the messenger VEGF as well as acetaldehyde. This increases the permeability of the endothelial cells, which is a key prerequisite for blood-vessel growth. Due to the acetaldehyde response, the sender module ultimately produced the signal molecule Ang1, which stops the permeability of the endothelial cells to inhibit blood-vessel growth. This signal system is also found in the human body. If VEGF spirals out of control, however, too many blood vessels form, which ultimately feeds a growing tumor. 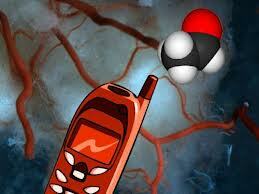 The "cell phone" could therefore be a plausible strategy to halt the pathological formation of new blood vessels. "Communication is extremely important in controlling blood vessels," says Fussenegger, "and we hope to be able to use synthetic 'cell phones' to correct or even cure disease-related cell communication systems precisely in the future with a 'therapeutic call'."